Abstract: Six allanite-bearing samples from different occurrences and locations including four pegmatites and two skarns are studied. The pegmatites are from the Yiyuanxing (M1663) and the Chahanying (M7673) in the Tsining of Inner Mongolia, the Amherst County Virginia of America (M4960), the Liksviken of Norway (M4976). The skarns are from Hebei Province (M1697) and the Chen County of Hunan Province (M1679). 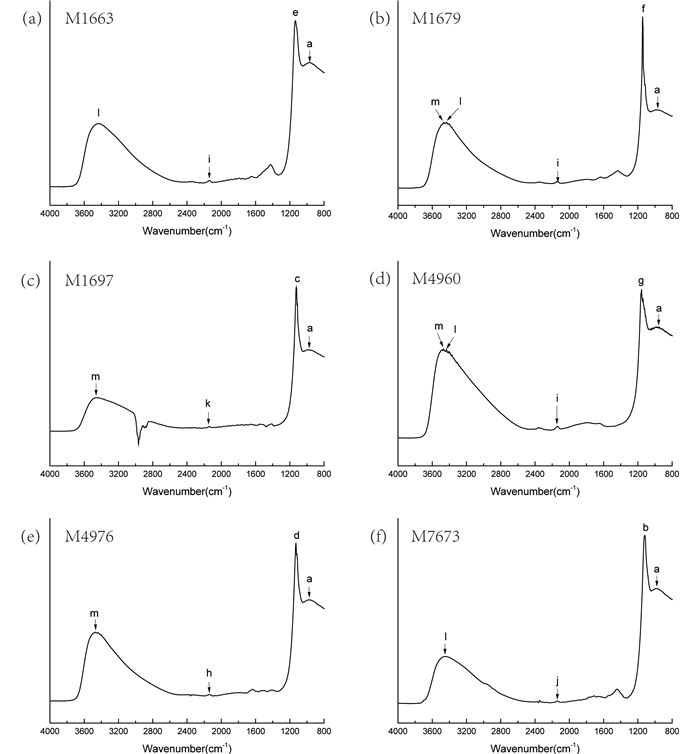 The chemical features of six allanite samples are revealed by analysis of the major and trace elements of Electron Probe Microanalysis (EPMA), Raman, Infrared spectroscopy. The results show that compositions of allanite grains are homogeneous. The allanite grains have cracks with vein filled. However, the contents of major element including FeO, CaO and Al2O3 and Rare Earth Element (REE) such as Ce2O3, Nd2O3 and La2O3 are different in the allanites. The systematic spectroscopic data of the allanites show that the characteristic peak intensity and their shift are related to their components, and assigning, discussing the relationship between special peak shift of allanite, the component of element and its crystal structure. The systematic research of Raman, Infrared spectroscopy and its constituent not only can reveal characteristics of the crystal structure, but also can discuss the difference between its structure and forming environment. Raman spectroscopy reveals that there are 20 Raman peaks of the allanites (ν1~ν20). The peaks shift of ν2~ν4, ν5~ν8 and ν16~ν19 are related to the substitution between Ca and REE. The ν10~ν12 are attributed to the O-Si-O bending vibration modes and their peak shift are related to Si content. The shifts of ν13~ν14 maybe result of the combined action of multi-element changes. 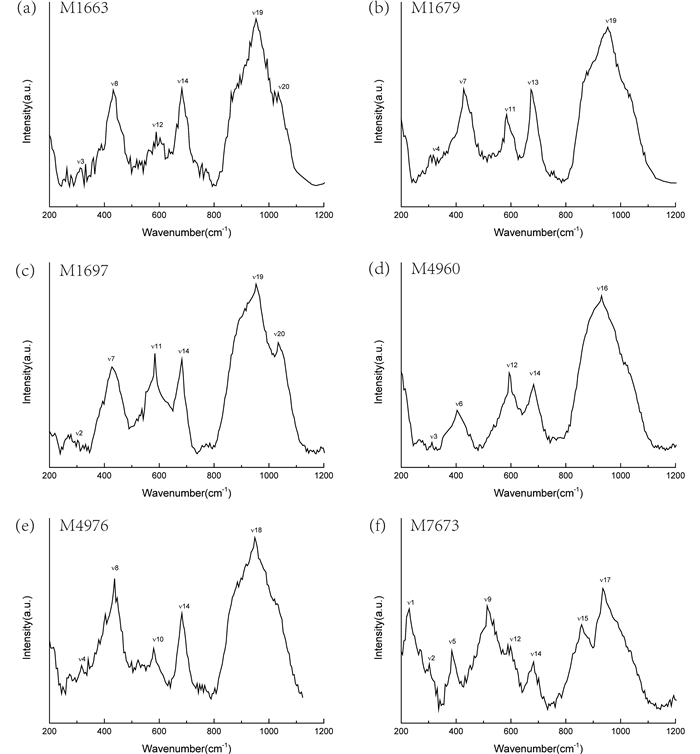 Infrared spectroscopy shows 13 infrared peaks (a-m) of the allanites. The peak shifts of h-k are described as substitution between Fe3+ and Al on the M1 or M3. The shifts of b-g are attributed to Si-O asymmetric stretching modes on the Si-O tetrahedron. The occurrence of OH double peaks of stretching (l-m) may be related to the content of Fe3+ at the M1 and M3. Our results show that substitution between Fe3+ and Al3+ of the allanite of the pegmatites is more than the allanite of the skarns. However, substitution between REE and Ca on the A of the allanite of the pegmatites is less than those of the skarns. Cui TS. 1995. Research on high REE allanite and its prospecting significance. Journal of Guilin Institute of Technology, 15(2): 137-141. Dollase WA. 1968. Refinement and comparison of the structures of zoisite and clinozoisite. American Mineralogist, 53(11-12): 1882-1898. Gu XP. 1989. Characteristics of the rare earth composition of allanite and their geological implications in Xinfeng granite. Mineral Resources and Geology, (3): 47-50. Gu XP. 1995. Research of metagenetic allanite with IR. Mineral Resources and Geology, 9(48): 275-279. Guo HH, Xiao YL, Gu XP, Huang J, Hou ZH and Liu HY. 2014. LA-ICP-MS Allanite U-Th-Pb Geochronology study on Guangdong Xinfeng REE-rich granite. Acta Geologica Sinica, 88(6): 1025-1037. Langer K and Raith M. 1974. Infrared spectra of Al-Fe(Ⅲ)-epidotes and zoisites, Ca2(Al1-pFep3+)Al2O(OH)[(Si2O7]. American Mineralogist, 59(11-12): 1249-1258. Liu CL. 1959. Allanite in skarn. Chinese Science Bulletin, (10): 132. Makreski P, Jovanovski G, Kaitner B, Gajović A and Biljan T. 2007. Minerals from Macedonia XVⅢ. Vibrational spectra of some sorosilicates. Vibrational Spectroscopy, 44(1): 162-170. Mitchell RS and Redline GE. 1980. Minerals of a weathered allanite pegmatite:Amherst County, Virginia. Rocks & Minerals, 55(6): 245-249. Petrusenko S, Taran MN, Platonov AN and Gavorkyan SV. 1992. Optical and infrared spectoscopic studies of epidote group minerals from the Rhodope region. The Review of Bulgarian Geological Society, 53: 1-9. Winkler B, Langer K and Johannsen PG. 1989. The influence of pressure on the OH-valence vibration of zoisite:An infrared spectroscopic study. Physics and Chemistry of Minerals, 16(7): 668-671. 崔天顺. 1995. 高稀土褐帘石的特征研究. 桂林工学院学报, 15(2): 137-141. 谷湘平. 1989. 广东新丰稀土花岗岩中褐帘石的稀土组成特点及其地质意义. 矿产与地质, (3): 47-50. 谷湘平. 1995. 变生褐帘石的红外光谱研究. 矿产与地质, 9(48): 275-279. 郭海浩, 肖益林, 古湘平, 黄建, 侯振辉, 刘海洋. 2014. 广东新丰稀土花岗岩中褐帘石LA-ICP-MS的U-Th-Pb定年研究. 地质学报, 88(6): 1025-1037. 刘长龄. 1959. 矽卡岩中褐帘石的发现. 科学通报, 10: 132.